NEW YORK — The X Prize Foundation, which developed a new philanthropic idea called “revolution through competition,” told participants today at the Clinton Global Initiative that it would commit $300 milion in the next seven years to help solve global crises in each of the four CGI focus areas. The foundation said it is developing new prizes to increase access to renewable fuels, improve energy efficiency, and promote use of cleaner fuels. It also will have new competitive prizes to improve cancer detection and treatment, improving schools and curriculum, and stimulate market-based strategies to produce jobs in poor nations. The announcement was among the stream of innovative ideas, fully funded, designed to respond to global problems that defy government’s abiity to solve. 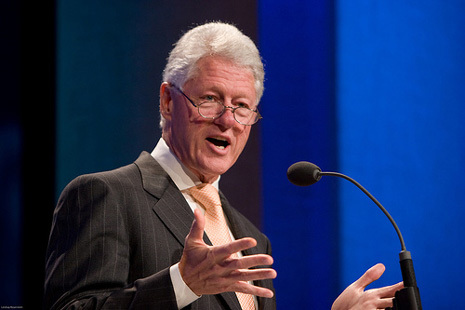 Other commitments described by Mr. Clinton today include the Sabin Global Health Institute’s $25 million commitment to treat neglected diseases, the Dell Foundation’s $25 million commitment to improve education in poor countries, and Intel’s $300 million five-year commitment to expand and improve its online curriculum to train teachers in developing countries. The clear priority and focus this year is action to impede climate change, illustrated by multi-billion commitments made by big players. Yesterday Florida Power and Light announced a $2.4 billion energy efficiency and clean energy initiative that includes constructing a solar-powered electric plant. Today Standard Chartered Bank committed to spend the next five years underwriting $4 billion to $5 billion in debt for renewable energy projects with a total project value of $8 billion to $10 billion. The bank said it will target clean energy projects in Asia, Africa and the Middle East and focus its efforts in areas such as wind, hydro, geothermal, solar, biomass and coal bed methane. Duke Energy and a coalition of other utilities — Consolidated Edison, Edison International, Great Plains Energy, Pepco Holdings, PNM Resources, Sierra Pacific Resources and Xcel Energy — pledged to increase their collective investment in energy efficiency to serve 22 million customers in 20 states. The collaboration was valued at $3 billion over three years. Mr. Clinton said it will lead to the elimination of 30 million tons of green house gas emissions per year-the equivalent of taking 6 million cars off the road. With the Edison Electric Institute, the companies also will establish the Institute for Electric Efficiency, enabling them to share and promote best practices in energy efficiency. I’ve attended a lot of conferences over the years, and elements of this one mimic those. Panels of leading figures in industry, academia, business, and the non-profit communities regularly convene in panel discussions that occasionally divulge some interesting tidbit that you’ve never heard of seen before. Jane Goodall’s chimpanzee greeting yesterday was priceless. But I’ve never been to a conference devoted so thoroughly to making things happen, and so much money committed to supporting change that will make a difference. The competition for ideas and attention here is fierce, and the players, particularly the industrial executives, are unexpected. Many of these same suits — Wal-Mart chief executive Lee Scott, for instance, devoted all of the previous years of their careers leveraging the status quo to make billions and contribute mightily to the global environmental crises they seek to solve today. Many of these same people voted for George Bush, no friend to energy efficiency he, and some of them did so twice. Redemption, though, is a powerful motivator. And we’ve been told this week, most pointedly by Ted Turner, that there’s money to be made in solving any one of the global problems discussed here — energy and climate change, education, poverty, and health.